A brand new mod for Fallout 4 which is making splashes across the modding scene, Pilgrim, makes sweeping changes to the atmosphere of the Commonwealth. Rather than the happy-go-lucky soundtrack of Dion’s The Wanderer and a bright landscape, Pilgrim has vault dwellers met by screams of terror in the distance and visuals so saturated they would make Cliff Bleszinski weep in awe. The mod is whats called an ENB, short for ENBseries, which is a type of post-processing engine that exists for tons of games, primarily those made by Bethesda Softworks. It allows people to heavily modify the way the game’s post-processing effects like Bloom, lens flares, or image distortion. This allows for mods like Pilgrim to look as saturated as it does. The difference with Pilgrim however, is that it skips the process of installing ENBseries from the creator’s site and turns it into a full on graphical modification that also alters audio files. Kotaku’s Kirk Hamilton said “it looks like a whole new game.” Well, looks can be deceiving. Its one thing to see screenshots versus playing the game yourself. I tried the mod myself just a week ago, and was blown away. However, I actually disabled Pilgrim after just a few minutes of use. I thought it was a darn fine ENB mod, making the game really atmospheric. There was only one problem: a “horror” atmosphere clashes with the entire game’s structure. The regular, and often relaxing returns to settlements and towns to sell items or store junk really clashes with the atmosphere it creates. In a game where you can re-skin mini-nukes to look like your in-game baby, a horror vibe simply just isn’t fun. Now, there absolutely is plenty of space for horror in Fallout, in fact its what makes the game fantastic sometimes. For anyone whose played through Fallout 4 (unmodded, for the first run of the game as is customary) would remember the terror of the Museum of Witchcraft. For me, it was easily the most terrifying moment of the year back in 2015 (and I thought Trump running for president was scary). However, moments like that, when ghouls and deathclaws are trying to tear you apart, only take up a portion of the game. Fallout 4's Diamond City is a bustling city with bright buildings, but with Pilgrim, I found it to look drab and nowhere as monumental as it should be. The game can simply look way better than Pilgrim makes it, using one of the other amazing ENB’s which bring out the game’s powerful color and takes away from the game’s poor texture quality. 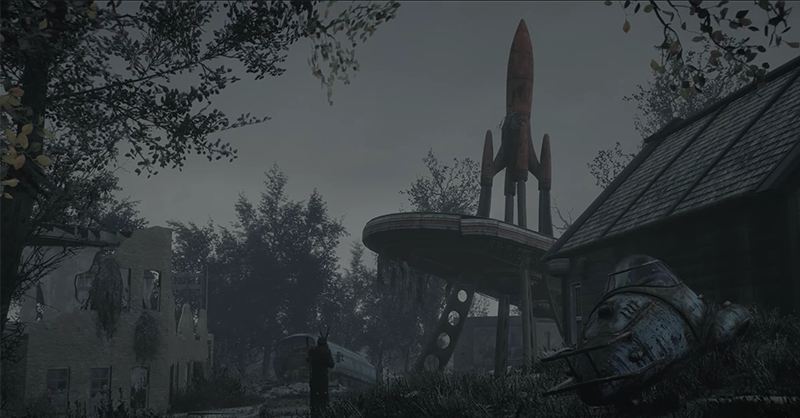 Using another mod made by Pilgrim’s creator, TreyM, an ENB called Cinematic Film Looks, Fallout 4 can really look good. The game goes from Pilgrim to CFL below. IMPORTANT NOTE: THIS IS A COMPARISON BETWEEN TWO ENB MODS, NOT PILGRIM VERSUS THE VANILLA FALLOUT 4. MY GAME HAS ALSO BEEN MODDED SO THE LAYOUT OF DIAMOND CITY IS VERY DIFFERENT FROM THE ORIGINAL VERSION. These two screenshots were taken at the same in-game time of day, so you can tell the two ENB mods differ greatly. Notice the bottom image with CFL installed, how the stands and lighting of Diamond city stand out. You have a bright exciting view, whereas with Pilgrim most of that image is blocked by a fog filter from the mod. As I said before, its one thing to look at screenshots versus playing the game. Pilgrim is really nice to look at and can make some really good videos, but it just doesn’t fit when you’re trying to get immersed in the game. Nevertheless, some people would like the version of Diamond City with Pilgrim. It looks dead, lifeless. Its representative of what the wasteland is like. It would work great for people who don’t like to mod their game too heavily, so there aren’t any explosive babies or comically sized breasts to take them out of the experience. Then again, Fallout 4 mods wouldn’t be the same without the occasional Macho Man Randy Savage or Loony Toons facial animation. Pilgrim can be downloaded via its Nexus mod page here.